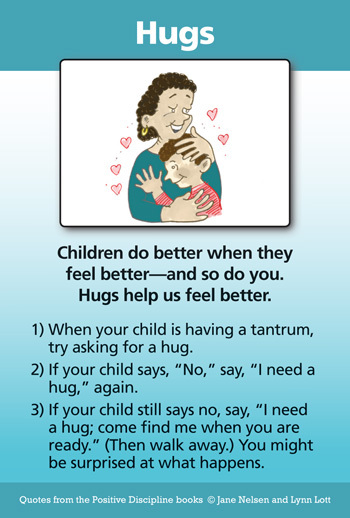 This tool card provides an example of asking for a hug when a child is having a temper tantrum, but that is certainly not the only time a hug can be an appropriate intervention when you understand the principle of hugs. Later, I’ll share where the example on the card came from; but first I want to share another example. My daughter, who is a wonderfully strong-willed six-year-old child, didn't want to get up and get ready for school one morning. Being a strong-willed individual myself, I could sense a battle of wills brewing—though I was determined to avoid it. I repeatedly asked her nicely to get up and get herself ready. I even picked out her clothes so she could move a little faster [a mistake that will be explained later]. Still, she refused to move. I reminded her, still nicely, that the bus would be at our house soon, and if she didn't get dressed she was going to miss it. She sat up, looked at her clothes, and screamed, "I don't want to wear that!" Her tone was so nasty that I found it hard to keep myself composed, but I went to her room and picked out two other outfits so she could choose which one she wanted to wear. I announced to her, "I laid out three sets of clothes. You need to pick one and get dressed." I had almost made it to the bedroom exit when she fired back "I WANT FOUR!" I was so angry at that point; and what came next surprised both of us. I walked over to her and said, "I am going to pick you up, hold you, hug you and love you...and when I am done you are going to get up, choose an outfit and get dressed." When I picked her up and put my arms around her I felt her just melt in my arms. Her attitude softened immediately and so did mine. That moment was amazing to me. A volatile situation turned warm in a few seconds—just because I chose to hug a child who was at that moment so un-huggable. In your lecture you talked about the power of a hug to calm down an out-of-control child. I've learned first-hand that you were absolutely right. Thank you for teaching others about the power of a hug! Note from Jane Nelsen: The morning hassles could be reduced if her daughter picked out her own clothes the night before as part of her bedtime routine. This would help her feel capable instead of being told what to do, which invited rebellion. This example illustrates that even though hugs may work to create a connection and change behavior, some misbehavior can be avoided by getting children involved in ways that helps them use their power in useful ways—for example picking out their own clothes. Now for the story that led to the example of asking for a hug when a child is having a temper tantrum. I watched a video of Dr. Bob Bradbury, who facilitated parenting courses in Seattle, WA for many years. During his parenting courses, Dr. Bradbury would interview a parent or teacher in front of a large audience. During the interview he would determine the mistaken goal of the child and would then suggest an intervention that might help the discouraged child feel encouraged and empowered. Bob shared the following example (which I am now telling in my words from my memory of what I saw on the video). Steven stopped sobbing and said, reluctantly, “Oh all right,” as he stiffly gave his father a hug. In a few seconds he just melted into his fathers arms. Since the mistaken goal in this case was “misguided power.” To suggest that his son needed a hug might invite him to say, “No I don’t,” and only intensify the power struggle. How could Steven argue with the fact that his father needed a hug? Children have an innate desire to contribute. Contribution provides feelings of belonging, significance, and capability. Steven was willing to “give” to his father, even though begrudgingly at first. Children do better when they feel better. Once Steven felt better by giving his father a hug, he let go of his tantrum and the power struggle and enjoyed the hug with his father. A misbehaving child is a discouraged child. It can be difficult to remember this when faced with annoying, challenging, or hurtful behavior. For this reason it helps to have a plan for behavior that is a pattern. Simply validate your child’s feelings. “You are feeling really upset right now.” Then step back and give energetic support while your child works through it. There are many other possibilities to make a connection and to help children feel better so they’ll do better. However, the main point is to see all of the Positive Discipline Tool cards NOT as techniques, but as tools based on principles. Techniques are very narrow and often don’t work. A principle is wider and deeper—and there are many ways to apply a principle. Go into your heart and your wisdom and you’ll know how to apply the principles of connection before correction, focusing on solutions, empowering children—and hugs. All of these Positive Discipline Tools are available in our deck of cards. Also avaiable as an app for iPhone and Android.